The DOOM engine is still the best engine everybody takes full advantage. 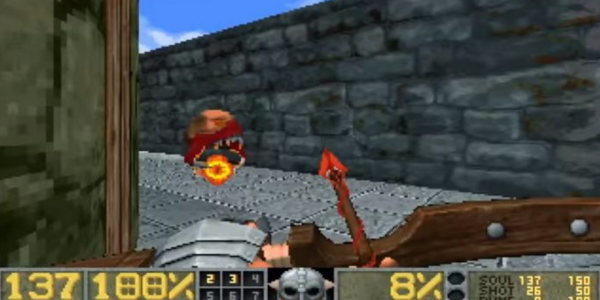 Now that DOOM Eternal is on its way, we have seen many stuff referring to the original DOOM. However, Rekkr is something that gives DOOM an entirely different tone while keeping its originality intact. Many modders and level creators keep using the original DOOM to produce various goods for the players. We have seen from a Super-Mario slash DOOM world to a romantic DOOM where you can view the demons as your other half. Moreover, we have even seen different source ports like ZDoom and GZDoom. However, in this situation, we are witnessing a Megawad that looks precisely like DOOM. The only difference is that the fan-favorite Doomguy is now some Viking-looking guy. This new game is called Rekkr, and it contains twenty-five levels. Furthermore, it has its one music and sound, which makes it more interesting. Nevertheless, another significant difference between Rekkr and DOOM is the enemies. This one seems to lack DOOM’s original enemies. They are a different type of entirely new monsters, nothing like the ones we have been used to in DOOM. The game will work in the ZDoom engine and some other source ports. However, you will be able to load it into the original game, if you want to. These kinds of new games resembling the first title of the DOOM franchise are somewhat sweet. Imagine if we have been waiting for so long for DOOM Eternal to be released without having something else to pass the time. Besides, if it looks like DOOM, it will most probably be a lot of fun. And nothing is more exciting than a new game based on the most influencing engine in the history of video games. If you are not convinced yet, you can have a look at its trailer below. Judging by the looks of it, it will be a pleasant tone to what we already know from the old DOOM. You can also download and play the game by clicking here.